There are few cinematic scenes as evocative and romantic as Meryl Streep and Robert Redford’s flight across British East Africa in the 1985 Academy Award–winning film Out of Africa. 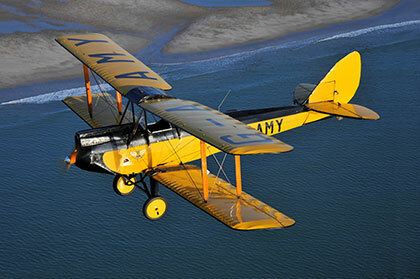 On February 7 at the Grand Palais in Paris, Bonhams—one of the world’s oldest and largest auction houses—is selling the iconic biplane used in the movie. The aircraft, a metal-framed De Havilland Gipsy Moth from 1929, was one of the first models to bring private aviation within reach in the early 20th century and is fully functional today after a full engine overhaul in 2011. After its spectacular flights in Tanzania and Nairobi in Out of Africa, the biplane has been used regularly and expertly maintained. “Bonhams is, of course, delighted to present this modern piece of memorabilia in such a magnificent venue, steeped in the history of the motorcar,” says Philip Kantor, the specialist at Bonhams in charge of the sale. A rare chance to own a coveted piece of Hollywood history, this is not to be missed. Estimate price upon request; 21 Ave. Franklin Delano Roosevelt; bonhams.com.